Tasmania’s West Coast Wilderness Railway is a steam railway like no other and an essential experience for any visitor to Tasmania. 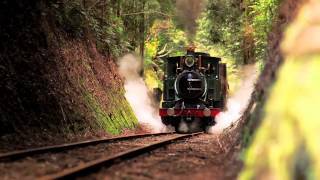 It operates full and half-day steam train journeys along a historic 35km track between Queenstown and Strahan on Tasmania’s wild West Coast. Passengers have a choice of the Heritage Carriage, with drinks and snacks available for purchase along the way, or the indulgent Wilderness Carriage which offers fully inclusive catering and a welcoming glass of Tasmanian sparkling wine on boarding. As they pass breath-taking scenery that is only accessible by this railway, passengers are invited to step back in time. They are told the fascinating stories of the hardships of the railway’s construction and the fierce competition with the operators of the other mines and railways in the area. The train stops at stations along the route which offer activities including a rainforest walk, viewing the train being turned on a manual turntable, panning for gold, tastings of wild honey and stunning photo opportunities. The West Coast Wilderness Railway operates year round on seasonal timetables, with a range of full and half day return tours departing from either Queenstown Station or Regatta Point Station in Strahan. This half-day (morning) steam train journey travels the steep grades of the Rack and Pinion that the West Coast Wilderness Railway is renowned for. The King River Gorge and rainforest complete the experience. Sit back in comfort as your guide brings stories of the railway and its resilient people to life. Discover how the feud of the Irishmen helped shape the wild West Coast. Departing at 0830 from Regatta Point Station in Strahan, travelling to Queenstown and returning to Strahan 1730. Operating on Mondays,Tuesdays and Wednesdays during the Summer Season this full-day return steam train journey includes the King River Gorge, the "rack" section of the railway track, magnificent rainforest and all stations along the way. The train stops in Queenstown for one hour allowing passengers to explore the historic mining town and discover the region's rich history with an optional guided tour. With so much to discover you will return to Strahan having experienced this remarkable railway and its triumph over adversity. Four hour, half day journey, departs Regatta Point Station, Strahan for the journey along Macquarie Harbour and the King River Gorge for Dubbil Barril and return. Take in the fabulous harbour views as the train follows the foreshore and then the river as you journey deep into the rainforest. Marvel at the engineering feats as the train crosses the many bridges, including the formidable iron bridge, one of the two major river crossings on the line.